OMG! I've been looking for this book for almost 20 years. I can't even begin to describe to you my sheer elation in seeing this again!! I had this book as a kid and my mother threw it out when I was in junior high. I used to read it all the time and had it's cover emblazoned in my brain for years. Over the years I had one problem--I couldn't remember the title. 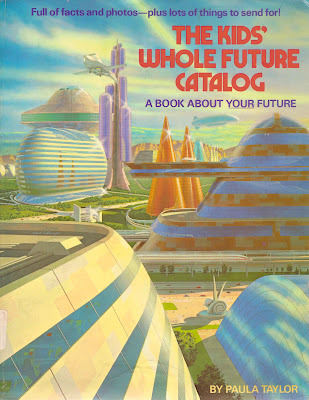 At last the answer has arrived, it's called, "THE KIDS WHOLE FUTURE CATALOG!!!!!!!" Thank You! I was beginning to think I would never see it again!!! I had that book! Wow, that takes me back. This was my very very favorite book as a kid; it took Amazon several years and a somewhat ridiculous amount of cash to find me a copy to share with my own kids. I think I still have a copy of this book. I remember getting a copy when I was a kid, then found another copy at a yard sale about ten years back. I was googling around for fun when I came across this. I'm a huge fan this book. Like everyone else I had a copy in the early 80s. I too forgot the title, but about five years ago I somehow recalled it and bought a copy on eBay for a few bucks on eBay. A few years back I happened across a box of books at my parents house and found my original copy. So now I have two! As for the book itself, thumbing through it today I realize just how super progressive it was. The section on "Future Families" would have Focus on the Family seething if they could see it. Anyway, glad to see that I wasn't the only nerdy kid in the 80s who loved this book.